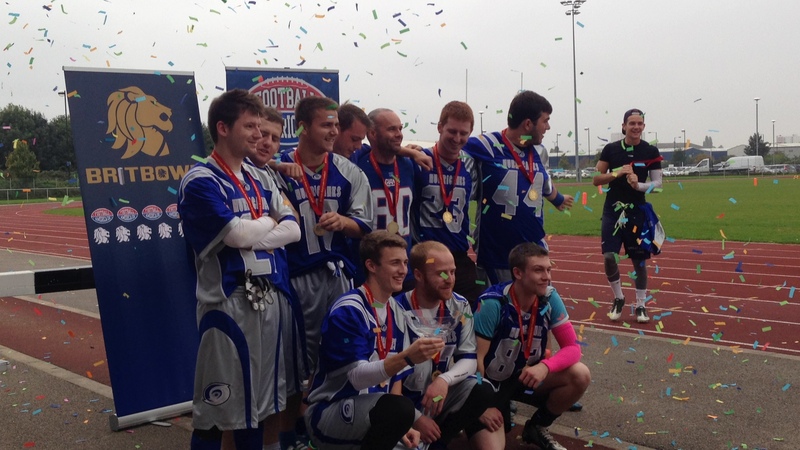 Back in April, teams from Leicester to Merthyr Tydfil kitted up with a dream: A dream of BritBowl glory. For some, that dream has “next year” written over it in giant red marker, and is possibly spotted with tears. But what of the valiant few who’ve made it to playoff weekend? Well, there’s just one hurdle to go before the big show. The semi-finals will pit the highest ranked team remaining against the lowest, and the second highest remaining against the third. Two teams progress. The Birmingham Lions strode into the flag league with a win in the NuOla Spring Break tournament, swinging open the saloon doors with a satisfying WHOMP before coolly ordering a whisky from the mutton-chopped barman and notably failing to be shot by anyone. With their big entrance over and done with, they used their sharp-shooting skills to dispatch the rest of the SWC with the precision of a kid who’s spent their college money playing House of the Dead (teenage flag players: ask your parents). 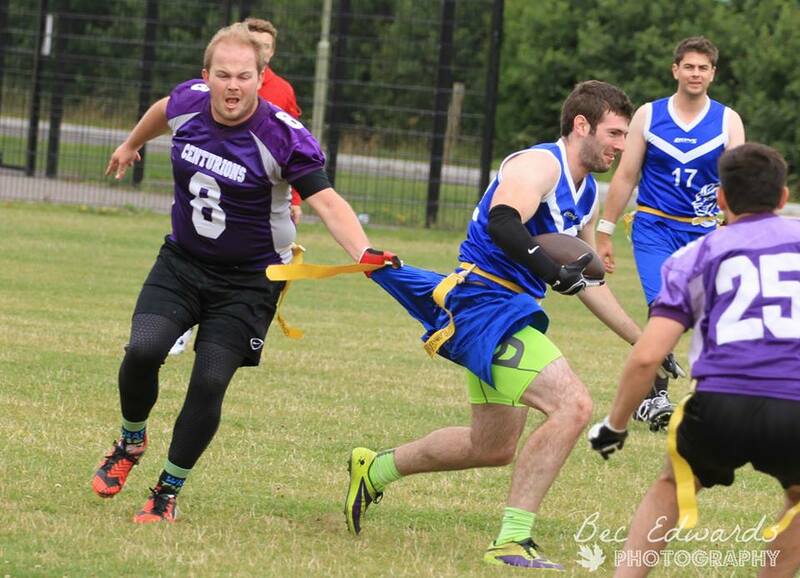 The most devastating win in Birmingham’s romp through their schedule came earlier this month, when they crushed the Cardiff Hurricanes underfoot by a score of 52-20. Those who predicted a shootout or a defensive tussle were equally wrong, as Birmingham eviscerated the Hurricanes like a particularly unpleasant director’s cut of Hellraiser. Dan Conroy is a ferocious blitzer, Alex Salter is a defender’s nightmare, and in Tristan Varney, they’ve got a QB that could drive a team to Athens on a single tank of gas (wait a minute, that metaphor’s just a bit TOO weird. Stop that – Ed). In any other season, Reading would be sitting pretty on top of the pile. And they’d deserve it too. When you’ve missed out on the playoffs by a whisker in a tough division, it’s perfectly acceptable to sit at home sobbing and stuffing your face with cheesy nachos until you’ve smeared yourself head-to-foot like a budget Goldfinger victim. But Nick Schippers and the Lions re-grouped and absolutely mauled the SEC South this year, striding past the Chichester Sharks, Victoria Park Panthers and the rollercoastering London Rebels. They’re a quick and aggressive side that are able to put up points, and it’s been their consistency that’s served them best in a season in which they’ve undeniably turned heads. 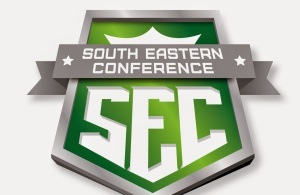 In fact, they’ve even had the numbers to field a second squad in the neighbouring SEC North, although they might regret splitting their squad now playoffs are coming and they’re fielding a squad of about five players. Still, it didn’t harm the Leicester Eagles last year. The 53-game winning streak came to a halt earlier this month. And it did so in a way that woke up most of the southern half of the flag world. Facing the “new batch” from Birmingham, Cardiff imploded into a cloud of confetti made of sadness and regret. The much-vaunted defense gave up 52 points to their SWC rivals, while dropped passes, blitz issues and even false starts derailed a quietly-efficient offense. Nuts. However, Cardiff might actually benefit from a little time out of the limelight. With Joe Cotterill at the helm, they’re undoubtedly confident, and Richard Phelps offers a turn of pace when they need to break open a secondary.Their D bites like piranhas at the front and lurks in wait for wayward passes at the back. They’re unlikely to demolish a playoff team with the authority that they knocked over the West Essex Showboats last year, but they’ve got the pedigree for a run. If they can get past their 2013 conquerers – The London Rebels – in the quarter finals. West Essex’s last act of the season was to plunge a dagger into the heart of Victoria Park’s playoff hopes, registering a 44-32 victory. It was one of the high points of a season in which they faced patchy opposition in their own division, but gave their opposing division a decent run in inter-conference play. While they didn’t get close to Reading and London, Nick Bertenshaw’s Showboats took out the Sharks and Panthers. Sadly for them: Guess which teams went through and which ones didn’t? Arse. West Essex are built as a confident passing outfit with a defense like a revolving hotel door, so expect high scores one way or another. Urgh. The stomach churns when we think back to London’s opening to the season. Hell, it seemed like every game brought a fresh loss and an injury to furrow the brow. Already missing star QB Calvin Tarlton for the early games, a couple of players dropped with nasty-looking injuries soon after, consigning the Rebels to the compartment in our big media-hype machine marked “Wobbling Giant”. However, they signalled their return with a 48-0 win over the Chichester Sharks, and did enough down the stretch to outscore and outperform the Panthers in a race to the finish. Now they’re in, they’re the season’s New York Giants: A little under-the-radar but durable, packed with pedigree, and slathered in momentum. Excuse us for a second: That metaphor’s made us queasy again. Northants bumped Leicester off the playoff perch on the last game of the season, capping a 3-0 weekend that demonstrated their ability to perform under pressure. Generally regarded as a well-run member of UK flag’s second-tier, the Titans have the opportunity to spring a surprise in their second-straight playoff appearance. While they were thoroughly outclassed by Cardiff last year, they’ve added experienced players such as Shadrach McCook this year, and their rookies have had another year to grow. 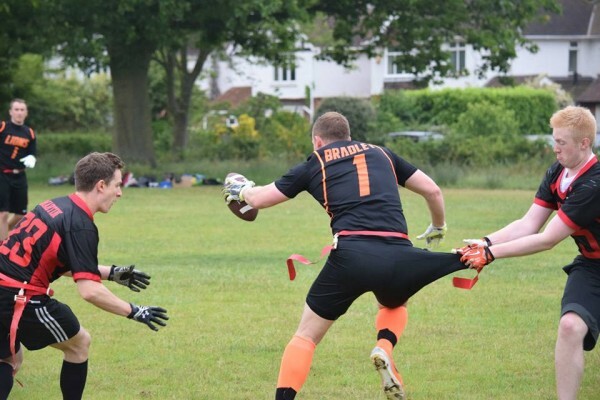 Their 62-0 win over the Solent Thrashers this month demonstrates that they’ve got a right to play with the big fish, and their first round match against the Showboats could conceivably go either way. Solent had the wind taken out of their sails somewhat when the Plymouth Buccaneers departed from their division, leaving them in a group of four where only two looked like realistic playoff qualifiers. But they’re an interesting wild card in this playoff bunch. 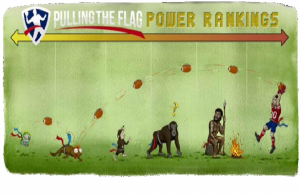 Their heavy loss to the Titans is a big red flag that marks them as long-shot outsiders to qualify. However, last year, the Thrashers were written off pre-game in their clash against the Showboats, only to seize an early lead. In the end, they were a calamitous safety away from a famous upset. Can they do that to the Reading Lions this time around? Ware’s victory over the London Barracuda ensured that they’d reach the playoffs with a .500 record (which is at least better than Calderdale managed last year). While players such as touchdown threat Jake Cooper have had a great year, they’ll have to answer the doubters in dramatic fashion on Saturday. A small team in their second season in the league, they’re currently the ’88 Wimbledon in this competition, while their quarter final opponents from Birmingham are – for the sake of scale – a Liverpool team made up entirely of 100-foot nuclear dinosaurs with laser eyes and platinum American Express cards. Good luck with that, Ware. Daniel McGill reckons Birmingham have too much for Ware, while Cardiff will take down the Rebels. He expects Reading to beat Solent and the Titans to defeat the Showboats. From there, he’s picking Birmingham and Cardiff to head to BritBowl. Neil Wymer says it’s going to be Cardiff, Birmingham, Reading and Northants in the semi-finals. He’s also going for Birmingham and Cardiff on September 26. “I have to go with the supposed two favourites here, but for a couple of different reasons. Firstly, having seen plenty of the Birmingham Lions this year, I just can’t see them being stopped in the regionals. Offensively, they execute as well as any team I have seen, certainly in the last five or six years, meaning even if they start slowly or concede some points early, they always give themselves a great chance of winning by zipping the ball round pretty much at will. I think they are nailed on to make the Britbowl from here as I expect them to beat Ware by a wide margin, probably leaving them with the winners of West Essex/Northants, both of whom I would expect them to be able to handle. After their demolition job on Cardiff a few weeks back, Birmingham are probably my favourites to take the crown. Looks like folk are hedging their bets in the PTF pundit team. Time for someone to prove them wrong? This year’s Southern playoff games will take place in Birmingham on Saturday August 22. Two teams will qualify for BritBowl on September 26. ← Previous Story Who Are UK Flag’s Stars of 2015?